SILFRA, ÞINGVELLIR is without a doubt a WORLD TOP 3 diving site (Dive magazine, October 2005), so for you travelling to Iceland and wishing to do one or two dives, this is the tour for you! Diving this dive site is a MUST for every diver visiting Iceland. 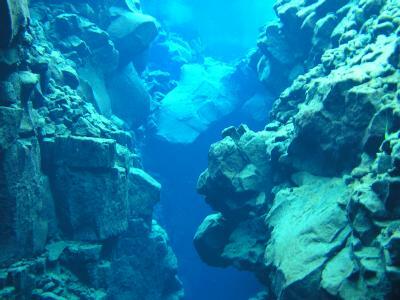 We at Diveiceland.com have been doing tours since 2001 so we have years of experience in taking divers to Silfra so if you are a certified diver with or without a dry suit experience, you can do it. You will be accompanied by a PADI Instructor or a PADI Divemaster. We at DiveIceland.com only allow maximum 8 divers on each tour and max 4 divers per Divemaster. This is one of the reason you should choose us for your diving experience in Iceland. Included in this tour are two guided dives, all the equipment needed, pictures from the dive, warm drinks and snacks. We offer free pick up from the Reykjavik area for this tour. You are of course free to bring any equipment you wish, but we do have first class equipment with dry suits in all standard sizes both male and female.